The Knight of Wands is powerful. He has uprooted his destiny from the systems of society and is independent from their support. He does not depend on the police for security, or the doctors for health, or a company for a paycheck. He is self-reliant and is the agent of his own free will. He knows how to organize reality so that everything aligns to his will. Some people might see him as fearless, but it is more correct to say that he is courageous. He believes in himself. He understands that things will not always be easy, but he knows that he can count on himself to pull through. He trusts that life will conspire to ultimately bring things together in his favor. The powerful dragon that he rides is his psychic will force; his chi. It rides in the air, independent of the earth. This energy is wild and powerful. 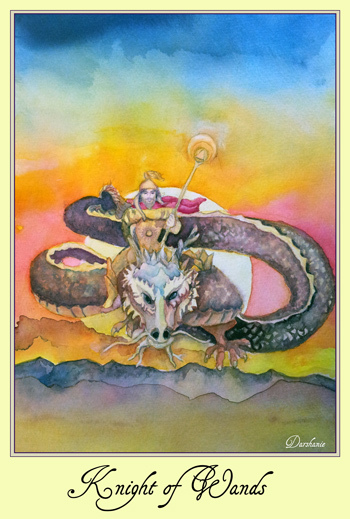 The Knight of Wands has to understand his vision to keep this dragon on course. This dragon’s natural movement is from side to side – it doesn’t fly straight. 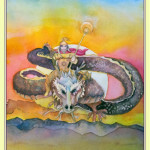 The Knight of Wands has to allow for this type of movement and by keeping his focus clear, he keeps this dragon on course. It is the way life works. When moving forward towards a goal, things never unfold orderly and on time. There are always obstacles, diversions and adjustments. The Knight of Wandsaccepts this and makes it part of the journey. Even failure is okay as part of the way and part of learning. He navigates with flexibility, allowing life to take him into the corners and loops that are necessary for growth. He also knows how to use those side to side experiences to strengthen his path and pool it into his goal. In the end, the side experiences make the journey richer than he ever imagined. The will is a new concept for many. Most people feel obliged and indebted. They do things out of guilt, fear, and conditioning. They play the victim side of the power game. The Knight of Wands has shed the victim mode and is in the victor’s mode. He controls, he decides, he rules. What a game life is. The Knight of Wands really plays it. When you get this card, take charge; trust yourself and your ability to pull everything together. Look at the sun for inspiration; let your fire, your energy become hot and shine like the sun. Martial arts and body building are excellent for supporting this energy. Go out and conquer. It is your day, your time and the world is here for you. This entry was posted in Tarot, Wands on May 10, 2016 by darshanie.